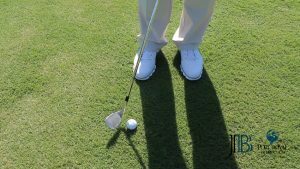 If you find yourself just short of the green on a tight lie and a hole location that is 20-30 feet away, be sure to use these two techniques to hit it close! Both techniques will vary the trajectory or a lower shot so that your landing zone will be more accurate and you will also find that you will be able to create some spin for added control. The first technique will be a shot that is going to be a lower releasing shot and the second technique will have a shot with more carry and more spin. The first shot is a low bump releasing shot off a tight lie. The first thing you’re going to do with your set up is have ball position slightly back, the club face to be toed-in just a little, that’s the key to have a low releasing shot. Once you have that set up, favor a little more of your weight to the left/lead side and have an arm swing with less wrists and more of your right shoulder and right arm. Think of how you can keep your right arm long and wide through the shot, that’s going to allow for more release on the golf ball while making sure you will hit it solidly. Be sure to stand tall even when you make contact while pointing the club head toward the hole to your finish. The second shot on tight lies around the green requires you to carry the ball a little further and create more spin. Use this shot when there is more slope to the green and it’s beneficial to carry the slope then spin it, all the while keeping the trajectory low. The goal is have a shot that hits, takes two bounces, and then it checks up. 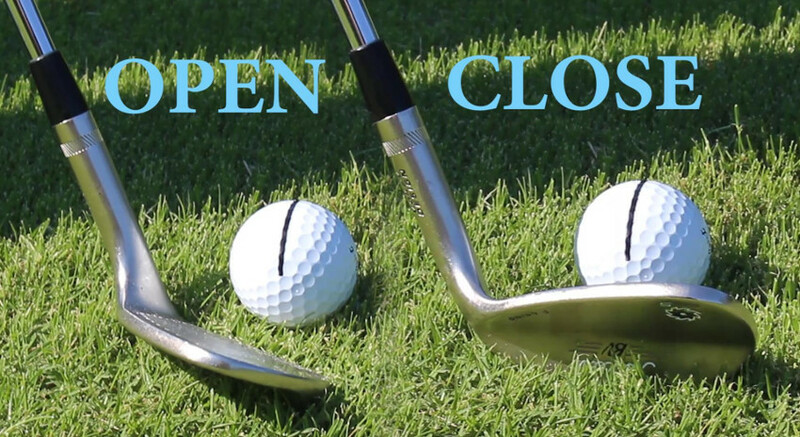 Check out the difference between open and close contact. Your set up will still need the ball at the back in your stance and have your stance just slightly left of your target with your weight still favoring your left side. 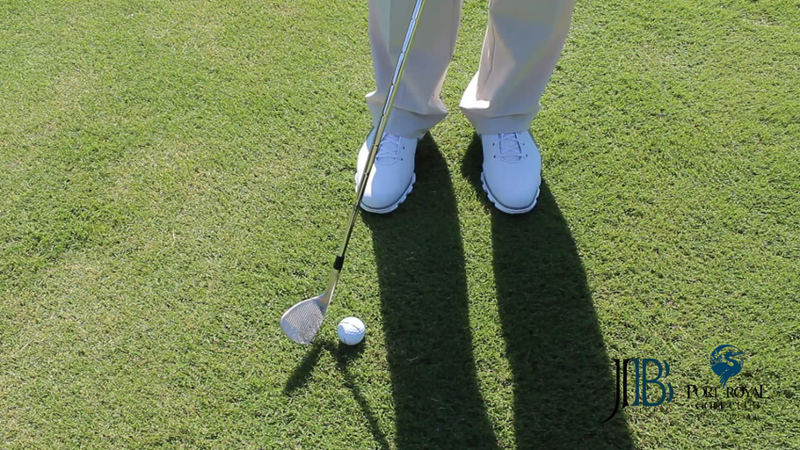 This allows you to still hit down on it slightly, but keeping the attack angle shallow. The second thing is you want to get the face of the club a little more open at address instead of closed like the running shot. You want more spin, so you’ll need the face open. With the face open, angle it toward the target. Make sure to have your release so that you have a little cup in your left hand and the face is looking back at you a little. That should produce a low checking spinning shot around the green. Remember to keep your arms soft, and use some arm speed to create the spin you are looking for. You want to get the face of the club a little more open at address instead of closed like the running shot.